It might be up for debate who made the first move between Amanda Barrett and Alex Mattera, but they both agree on how their initial meeting went. The one-time Penn State communications majors (he was in advertising and she was in PR) bumped into each other in a client relations class senior year, and, says Amanda, “When I stood up to introduce myself on the first day of class, Alex says he heard himself say, ‘Wow.’ Later, I moved to a seat next to him so that the professor wouldn’t see me doing THON [dance marathon] work rather than classwork. Things all started from there.” That cool-girl beginning culminated in the two getting married at the Creek Club at I’On a few years later. Their first dance tune? “Ho Hey” by the Lumineers, because cool girls pick cool first dance songs, of course. 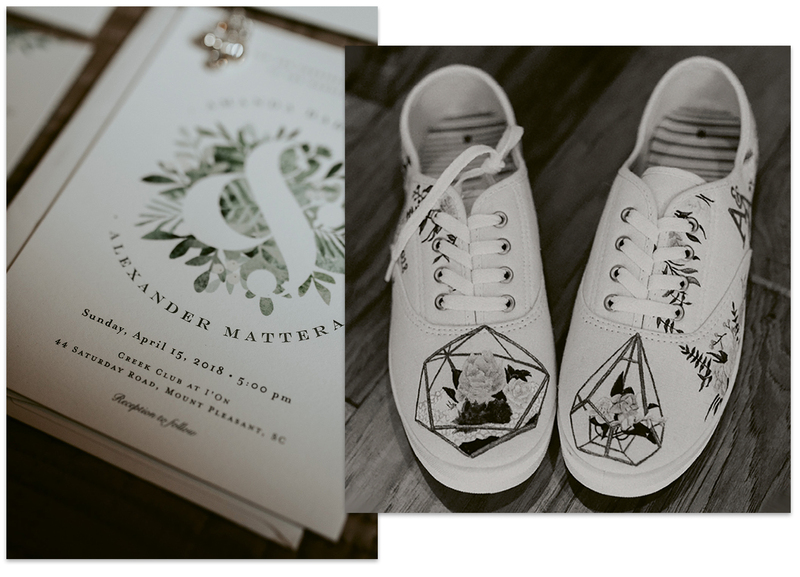 We thought their Big Day stood out for its mix of edginess and elegance, so for all those looking to add a spicy element to your sugary style, take a peek at Amanda’s do’s. Play to your strengths when planning. Pick a posse with a sense of humor. After a day of dress shopping, Amanda, her wedding party, and her soon-to-be mother- and sister-in-law all headed to a bar to watch Penn State play. When nearly everyone in their crew walked in with Nittany Lion shirts and leather jackets, they achieved gang status. 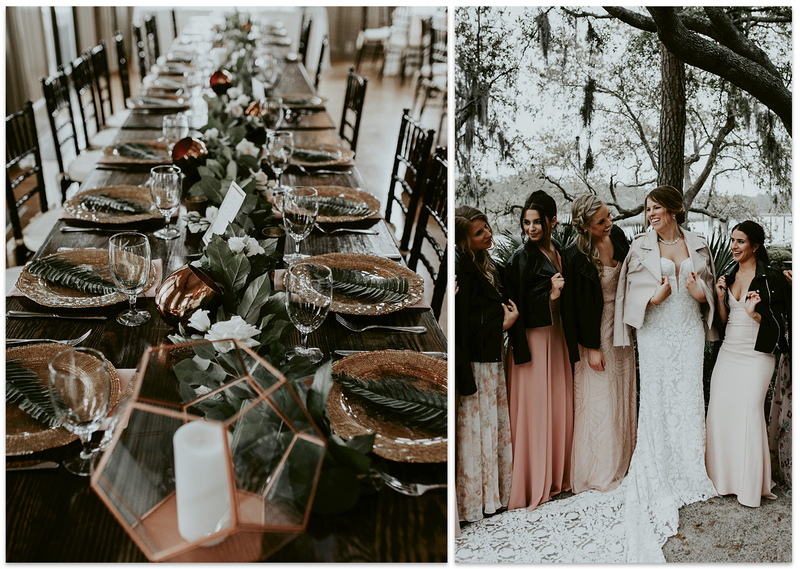 On her wedding day, the women gifted Amanda a blush-hued leather jacket and broke out their own coats for a few snaps. Give your girls a little guidance if they get to pick their gowns. Moscow Mules—the couple’s favorite cocktail—were served in copper cups filled with regular, his style, or her style. Guests at the head table were gifted personalized cups that had been tucked into the table runner greenery. Calligraphy, signage: Bennett & Co.